It is Sunday morning, the penultimate day of Arts in Marrakech, a multi-disciplinary arts festival held every other year in Morocco’s famous inland city of souks and snake charmers. A small audience is gathered in the concert hall of Riad el Fenn, a luxurious town house located down a grubby side street in Marrakech’s old city. 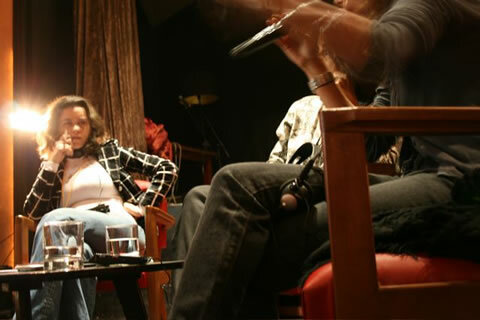 Sanaa al-Aji, a young Moroccan journalist and author, is conversing in French into a handheld microphone. Despite her obvious youth, al-Aji talks with a confidence and wit that belies the apparent austerity of this morning’s topic: women writers in the Arab world. At one point she cracks a joke about the “sexuality of the veil”, then gets more serious when she bemoans the fact that Moroccans haven’t learnt “the culture of debate”. Al-Aji is not showboating for the sake of her audience, mainly well-healed British culture tourists here to enjoy Marrakech’s celebrated bohemian indolence. Official censure hasn’t clipped the young writer’s wings. Al-Aji mentions a recent blog piece. Written in Arabic, it took issue with the use of loudspeakers to call the faithful to prayer. The audience titters at the remark, many no doubt having been woken by the day’s first call to prayer, made just before sunrise by a disembodied voice transmitted from one of the city’s numerous minarets. She goes on to say that the remark prompted one blogger to describe her as “anti-Islamic”. Al-Aji grins: it is less seditious than plainly cheeky, and functions as a silent but eloquent retort to her critics. The precarious politics of the crescent, or at least its abuse by rightwing interests in the Arab world, this according to Anglo Egyptian writer Ahdaf Soeif, was just one of many issues engaged with at this year’s Arts in Marrakech (AiM) festival.  Founded in 2005, AiM is the first major trilingual (English, Arabic and French) festival of its kind in North Africa. Offering a wide-ranging programme of talks, art events, film screening and socialising, the guest list tells its own story. Three heavyweight filmmakers were in attendance: James Marsh (Man on Wire), John Boorman (Deliverance) and a bearded Julian Schnabel (Basquiat, The Diving Bell and the Butterfly). The celebrity restaurant designer Mourad Mazouz was also in attendance, as too Cape Town-born Oxford-based author Barbara Trapido. My interests however lay with a Tangier-based photographer. I’ve been hoping to meet Yto Barrada ever since seeing her unorthodox documentary photographs on Africa Remix and the 2007 Venice Biennale. A finalist for the prestigious Deutsche Boerse Photography Prize in 2006, Barrada’s photographs deal with the meeting of Africa and Europe, the crescent and the cross. This might make them sound earnest and dull, which they aren’t. Barrada’s work communicates an understated confidence and levity, which is true of the photographer too. Like Saana al-Aji, Barrada has a mean grin. I learn this at a nursery on the outskirts of Marrakech. It is an unlikely venue for an art world encounter, but this is how Barrada does things. 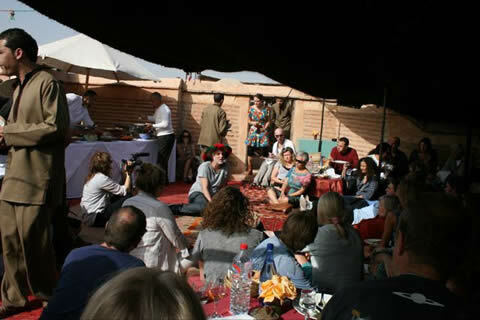 Director and co-founder of the Cinematheque de Tanger, North Africa’s first artist-run cultural centre focussing on cinema, Barrada choreographed an informal picnic at Casa Botanica as part of her involvement in AiM. The site is not without logic. Barrada’s current work looks at the making and marketing of contemporary Morocco. This necessarily includes its precarious flora, which like the Western Cape’s fynbos is under threat by residential and golfing estate developers. But this is simply the context: the picnic is a picnic, nothing more. After a lunch menu that includes quiche and wine, I introduce myself to the photographer. She is shorter than I anticipated. Barrada surprises me in another way: she asks if I know Greg Marinovich. I say yes, asking how she knows the Pulitzer Prize-winning photographer. She laughs. In the early 1990s, while studying political science at the Sorbonne in Paris, she went to the West Bank. She was interested in the dynamics of human movement in the area, in particular the roadblocks. At some point she started using a camera to record her observations. Around this time Marinovich was running the Associated Press office. Barrada begged him for a job, anything. Marinovich said he’d think about it. A year later he said okay. By then Barrada was plotting a different trajectory, one that would take her to Paris, New York and eventually Tangier. Barrada’s international acclaim is partly based on her long-term project documenting the Strait of Gibraltar. A watery line dividing the southern tip of Europe and North Africa, the Strait, which measures 24km at its shortest width, was a point of intrigue for many of the artists invited to show on AiM’s biennale-style exhibition, held this year in a disused palace that epitomises Marrakech’s inward looking architecture and opulently decorated courtyards. Francis Alÿs stands out as a highlight. Drawing on his training as an architect, the Mexico-based artist showed a multi-media installation comprising two information booths and four projections. The work is essentially a speculative proposal to build a bridge across the Strait using hundreds of boats. Titled The Floating Bridge Project, this new work pits the imagination of the artist against the science of the engineer and willpower of the politician. 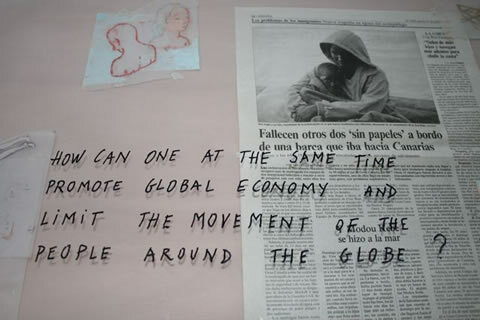 A devastatingly simple question frames Alÿs’ ephemeral project, which will be included on the artist’s forthcoming retrospective at the Tate Modern in 2010: “How can one at the same time promote global economy and limit the movement of people around the globe?” The question is at once philosophical and pragmatic. My initial flight plan to Marrakech routed me via London. A mandatory transit visa, costing more than R500, this to simply switch planes at Heathrow, put pay to that option. I ended up flying via Paris. This is not an entirely banal fact. We live in an era of contradiction, it would seem. Look at Sanaa al-Aji. 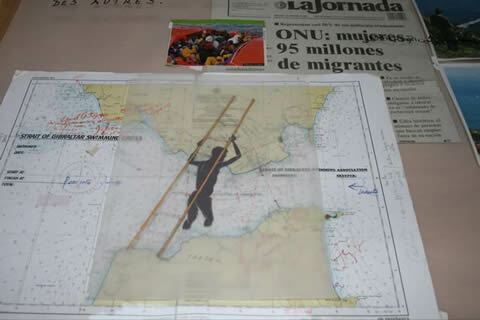 Look at the people staring across the Straits of Gibraltar in Francis Alÿs and Yto Barrada’s work. While gender, race and national identities increasingly hold little sway in how we imagine ourselves in the world, here we are, adrift on a continent ring-fenced by salt borders, invisible barriers and unremitting prejudices, each of reduced to perform some distant legislator’s fantasy of what we ought to be. Outsider. African. Woman. Whitey. Free only to imagine it can be different. Where do you recommend I get a copy? I checked Wiki but it is kinda thin on facts. I found a pdf copy online via google search.